The sunglasses in red hair. 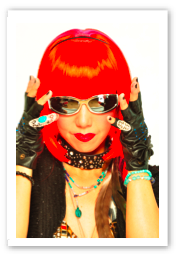 Magic Jamie is Visual Kei magician you Konasu to Illusion Lounge Magic! ! ! Magician with a mysterious charm adults and children will be glued. Invites the world to a magical audiences with skillfully English and Japanese. It is a show that is integrated with our customers. It is the magic that has changed little. Genki unique wonder fashionable, special stage show full of jokes in addition to the strange magic. The popular with celebrities for some reason. It is now in third place yahoo search in 2009. Impression degree No, 1. Jamie cheerful unique and is a popular to those of children and adults. I am also doing illusion in a group called Misty. Performers such as Tokyo hotel event television theater. Good at a strange magic, fun jokes, it is a popular magician with many encore. The live radio appearances Japan, to "120 minutes danger doctor a little"